Michelle Johansen Gifford from Riverside, California, and Sara Starkey from Salt Lake City, keynote Utah State University Eastern’s 39th Annual Women’s Conference on Friday, April 13, from 8:30 a.m. to 3 p.m. Fifteen workshops are offered throughout the day which ends with the announcement of Outstanding Woman of Southeastern Utah. Gifford, who grew up in Castle Dale, Utah, calls herself a motivational speaker, pod-caster, photographer, business coach and friend. Under the title of “I am Michelle Gifford,” she uses her keen business sense on the Internet to teach inspirational topics to her followers. She has an Online book club with February’s selection titled “Start” by Jon Acuff. It was named to the New York Tiimes Best Seller list with an image of a button switch on the cover with average on the left of the switch and awesome on the right of the switch. Acuff wrote to punch fear in the face and escape average by doing work that matters. Her March Book Club selection followed Acuff’s next book titled “Finish” about giving yourself the gift of done. She names her five pillars of influence as blog writing, email marketing, social media training, photography basics, Pinterest, business and mascara business. She offers courses in branding, helping take the next step in business, helping start your business, how to create a blog in 30 minutes, email marketing blog posts plus social media and Pinterest blog posts. Recently she appeared on KSL’s Studio Five, where she discussed how hundreds of photographers from across the nation are giving away free photo sessions in an effort to show women their true beauty. Beauty Revived is a photography movement she started where photographers donate a photo session to deserving women to help share their story. These stories are featured on www.beautyrevived.com. Women who have battled cancer, have a deployed husband and have lived exemplary lives have been featured. The stories are diverse but the message is the same: beauty comes from a life of courage, kindness and strength. A transplant from Spokane, Washington, Starkey is general counsel for Larry H. Miller Dealerships. She was named one of Utah Business’ Forty Under 40, recognized for her role providing legal counsel to the 55 Larry H. Miller Dealerships in seven states, Saxton Horne Communications and Total Care Auto, as well as her community involvement. An active member of the Salt Lake community, she devotes many hours serving organizations such as The Road Home and Girl Scouts of Utah. She leads an outreach Girl Scout troop consisting of girls who reside in The Road Home and is dedicated to supporting interests of the disadvantaged and undeserved in the community. 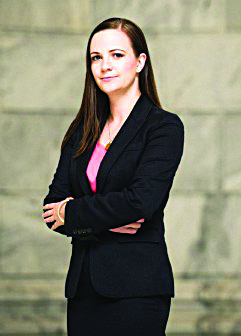 She serves as the community outreach chair for Women Lawyers in Utah. She practiced law in Los Angeles, California, specializing in asset protection and wealth management, corporate structure and compliance, employment law, estate planning, real estate and high-net-worth family law. Her presentation will be at a lighthearted look at the opportunities and challenges of growing up as “Sara Starkey.” She will bring her perspective into why it’s great to be a Utah woman. The conference includes a continental breakfast and lunch. Online registration is at usueastern.edu/womensconference/ Tickets are $25 for adults, $15 for students.